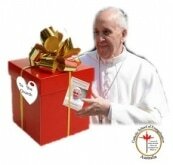 This course acknowledges Pope Francis’ tremendous gift to the church – Evangelii Gaudium. It also identifies the greatest gift we can receive – the knowledge & experience of God’s love. Participants, through a kerygmatic experience have the opportunity of deepening their relationship with God. Participants are given tools to assist their attentive listening skills so as to improve their art of accompaniment EG169. when listening to God & to others. Drawing on Evangelii Gaudium & CSOE techniques, participants learn to present the kerygma & bring the love of Jesus to others EG127. Gift Wrapping details many ways in which the kerygma may be presented in a variety of locations & for a variety of audiences. Practical methods to take the church out into the streets EG49. Pope Francis calls for attention to the bigger picture, openness to suitable processes & concern for the long run EG225. Details are given of how the CSOE is able to train & equip parishes to become self-sufficient Parish Evangelising Communities. It concludes with Pope Francis’ prayer seeking the intercession of Mary ~ Star of the New Evangelisation.